I am not a technician, and I am not an expert. I simply wanted to write this down in case anyone else finds it useful in the future. Information on this type of equipment is scarce so this bit may be of value to someone someday. I apologize for not having illustrations, but it did not occur to me to take photos until the unit was repaired. There's no way I'm pulling it apart again just for this. Sorry. I've owned Omega equipment before—I had a D3V for several years. It used a head that had the power supply incorporated into the lamphouse, so all you had to do was plug it into the wall or a timer and you were good to go. But when I purchased a D5XL, it had a Super Chromega Dichroic II lamphouse, and that's a different animal altogether. The lamp is in the lamphouse, but the power supply is a separate, detachable unit. The cord that comes out of the lamphouse is a special one that will only plug into an Omega power supply. My machine did not come with a power supply, so I had to look for one. From research, I figured I had two options. 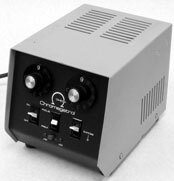 (1) was to buy a standard power supply, with or without a timer (which together made what Omega calls a "power tower") and the highly-recommended voltage stabilizer. (2) I could buy a Chromegatrol, which incorporated all three items together into one package. For better or worse, I went with the latter. So I found one on eBay for a reasonable price, and of course they said it works (everything on eBay supposedly works). Something didn't work. I plugged everything in and the Chromegatrol lit up, and the fan in the lamphouse fired up, but the projector lamp wouldn't work. I'm not an electronics tech, but luckily my father is, so he traced it. We determined that the enlarger lamp worked, and that the socket worked. So that was covered. That meant the problem was in the Chromegatrol. The Super Chromega II lamphouse runs on two separate voltages. The projector bulb (an ELC) runs on 24V. The cooling fan and the panel lamp, however, run on 110V, so the Chromegatrol feeds both separately. My Chromegatrol was giving me the 110V, but the 24V output was dead. Now here is where things get interesting. There are at least three different versions of the Chromegatrol, going by Omega Catalog Number. There's the 412-037, the 412-040, and the 412-045. There may be others but these are the ones I'm aware of. I emailed OmegaSatter and requested a schematic. They gave me the one for the -040 and -045 variants, but they did not have anything on my -037. All three versions use an IC to control the timer (an LM322N), but the -037 has two additional ICs, both of which use Omega house numbers, so there's no cross-reference. If those were bad, the only way to replace them would be to find another -037 for salvage. Click here and look for the link to the schematic for Chromega models -040 and -045. The	-037 is not available (see text). I did some internet searches. Harry at the Omega Help Forum had some great info. Using his advice, we elminated the problems with swtiches and connections. Our problem was that voltage wasn't getting to the transformer, and that meant the problem was the PC board. The relay points looked scorched, so we cleaned up the contacts as much as we could. There was a broken connection on one of the resistors. We tested the resistor and then soldered it back into place. Still dead, so we started checking other components. Ultimately it turned out the diodes were bad. There are two zener diodes that act as voltage regulators, and they were bad. Replacements were .49 cents each. Soldered back in, and the Chromegatrol operated properly. Don't buy the -037. You can't get the schematic, and if the two special ICs are dead, you probably can't replace them.